The truth is that once turned inside out by experience, we’re opened to the life of others and challenged to enter the endless river of feeling. Those who think they can skip over life by never showing their insides take a different road. Wholeness demands opening up and feeling. With those who won’t accept this, there is less and less to share. If blessed, we’re broken of our stubbornness and humbled to discover the larger wholeness we’re a part of. Even so, relationships have a natural course. They blossom and die, as we connect and disconnect. We lean on each other, then back away. We think we can make it on our own, then need each other nakedly. It’s all very humbling. I’ve learned over and over through my breakdowns and rearrangements that everything I’ve longed for was already close at hand. I just needed to recognize it, befriend it, love it, and embrace it. This changed what I’d been taught about willfulness and control. Tenderly, I’ve learned to align with the forces around me and have stopped trying to defeat them. To defeat experience is like a fish trying to defeat the very river on which its life depends. This book encompasses almost thirty years of work? Can you tell us about the themes and ground this book covers? One of the great transforming passages in my life was having cancer in my mid-thirties. This experience unraveled the way I see the world. It scoured my lens of perception, landing me in a deeper sense of living. Twenty-eight years ago, that struggle brought me close to death. Today, I remain committed to surfacing the lessons of transformation, as they continue to shape the lens that life has given me. The transformative events may differ for each of us, but every soul will face a life-changing threshold that will keep shaping who we are for the rest of our life. This book gathers twenty-eight years of my writing and teaching about suffering, healing, and wholeness. What you have in your hands is a thematically integrated work that draws from three sources that span all these years: the original poems and prose from the first edition of Inside the Miracle (1994, 1996, now out of print), ten relevant essays from my collected personal essays, Unlearning Back to God (2006, now out of print), and thirty-six new poems and prose pieces not yet published. You speak about this book as if it’s alive and growing? What do you mean by this? Transformation, even from a single event, can continue for eternity. And so, I continue to be transformed by my journey with cancer. This is a book that continues to be written, because this is a story that continues to be lived. I felt compelled to expand this book because almost dying and having cancer crack my life open continues to deepen who I am. I felt compelled to rework and further unfold these life lessons as my understanding keeps evolving. I felt uplifted to add new lessons from the growing perspective of decades. This book tries to gather some of what I keep learning along the way. What does the subtitle enduring illness, approaching wholeness mean? We are each in a lifetime conversation with suffering and care that, in time, will open us to our strengths and gifts. We are meant, it seems, to come apart and come together, so we can discover who we are at the core. We are meant, it seems, to be rearranged by what we go through and held up to that process by those who care. We are meant to accept suffering and care as our teachers, our mentors, as the tools used by time to shape us into what matters. 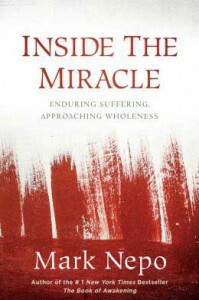 So, though no one can tell us how to endure our way into wholeness, there are common passages. We can help each other learn how to withstand the hardships of life and we can love each other into the fullness of a whole life. Though we never finally arrive, we keep maturing and refining through the good use of our heart. Through this unending process, we help each other stay alive and be alive. You have been through a great deal in your life, and yet you speak of joy without denying the hardships. How are you able to hold both? What I’ve endured is the journey that everyone endures in different circumstances and with different names. Sooner or later, we’re asked to be honest with our fears and hopes; to render, through our experience, the irreducible mystery of life in which we all swim. After all this way, I know that I am weak and strong, stubborn and determined, afraid and brave, giving and demanding, resilient and stalled, confused and clear—sometimes all at once. I know now that going on without denying any aspect of the human drama is what strength is all about. We are carved by life into instruments that will release our song, if we can hold each up to the carving. But it’s all for the release of our song while we are here. Joy is the transformation of our suffering, not the escape of all we have to face. How we preserve what matters and how we create medicine out of our suffering can help us heal and approach wholeness. Throughout the book, you speak about the challenges and gifts of true relationship. Can you give us a sense of what this holds for you? One of the great paradoxes of being alive is that each of us is born complete and yet we need contact with life in order to be whole. Whether conscious of it or not, we are all engaged in this search for other life, so we might join with the rest of life and be complete. Our longing to join and come alive is our birthright. This is similar to pollination. We complete the world when, opening ourselves against great odds, we inadvertently seed each other’s essence somewhere else in the world to grow. This is the purpose of true relationship: to enliven what is dormant within each other. Once enlivened, it is our responsibility to keep what’s dormant conscious and to integrate the fibers of hard-earned experience into the fabric of a living spirit. The gift of true relationship is that we awaken and complete each other. How has your journey through suffering into the realm of wholeness changed you? I’m more open than I ever imagined. I’m at once gentler and more resilient. And though I’m less sure what to call the things that matter, I’m more certain that I live in their currents. I have more and more questions and less and less answers. I believe and experience the aliveness of Spirit that every thing in this world carries. That aliveness is my teacher. The last section of the book is called still here, still wondering. What are you still wondering about? I’m still learning. And I’m wondering what unfolds when we admit to our frailty. I’m wondering about the great teacher that is limitation. I’m deepening my vow to eat from the marrow of every moment without crisis or pain pushing me to remember I’m alive. I’m exploring the testaments to wonder and the work that releases it. I affirm how the path opened by expression leads us into meaning. And I struggle to understand the tension between knowing our truth and enduring rejection, disapproval, and misunderstanding. I keep exploring the constant need to remove the cataracts of mind that cover the pain and wonder of being alive. Most of all, I honor the inevitable call to be a bridge for each other, so we can endure what we suffer, and inhabit the gifts we were born with, until we can enter the days that remain with awe and wonder. What do you hope readers will take with them from Inside the Miracle? Though what’s unearthed here comes from the heat of my journey, the lessons are for everyday living. It’s my hope that the trail of this lifetime conversation with suffering and care will open you to the fullness of your own humanity. With a steadfast belief in our aliveness, I hope what’s here will help you meet and endure whatever way you’re being forged, and bring you closer to the gifts you were born with.